The Little Dessert Shop in Wolverhampton opened recently and after all the popular talk I decided to visit it for the first time with my friends. We were all very impressed… there was so much option to choice from on the menu, from a wide variety of different flavoured ice cream (skittles, fruit salad, kinder Bueno, bubble gum and many more), to sundaes, crepes and cookie dough. In the end we decided to go for the waffle and to say the least we loved it! I decided to have the “strawberry sensation” flavoured waffle and it tasted delicious. The waffle was served warm and was soft and fluffy which is how I like it. The waffle had melted milk chocolate and fresh strawberries on top. It was also served with a side of ice cream which was infused with light chocolate flakes, I think it’s called stracciatella gelato and this tasted divine. At first I thought that it might taste a little sickly however it was just right. 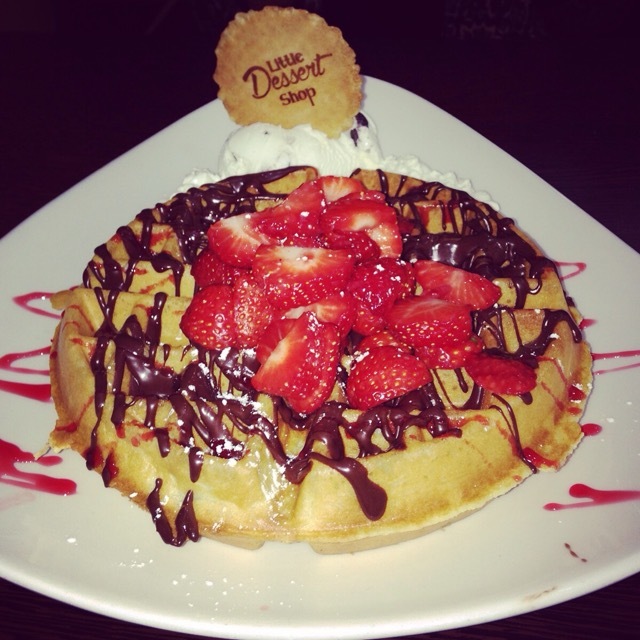 The cost of the waffle dessert was £5.95 and the portions were big so it was definitely worth it. I managed to eat all mine as I am a big dessert lover, but if you don’t eat it all you can have it packaged to take away. I would definitely recommend the “strawberry sensation”. I think the only downside was that we had to queue to get in and it is rather small inside but I can’t wait to visit again to try something new.